Welcome to our complete guide to good family dogs, helping you to pick the right breed of puppy for you. Find tips to help you make this important choice, and some great ideas of good family dogs from small, to medium, to large. For many of us, nothing says family like a dog snoozing on the floor at our feet. Adding a dog to your family, however, is a big step and an even bigger responsibility. You need a dog that fits into your lifestyle, doesn’t come with hefty medical bills, and is good around other living things, like cats and children. In short, you need to find the perfect family dog. But where to even begin your search? 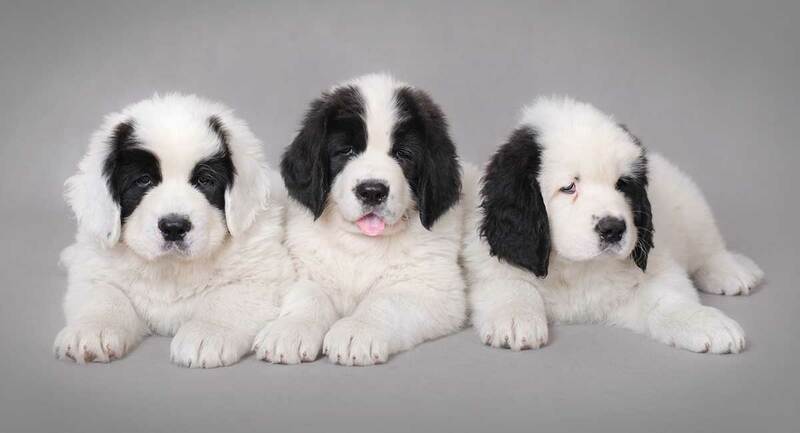 Finding the perfect family dog breed is tricky. There are so many variables! What dog will suit you best? There is no right or wrong answer, and the best breed for your neighbor might be very different than the right breed for you. The list of most popular dog breeds as of last year (2019’s list has not yet been published) makes for a start. But there are so many more than this! And how do you know which breeds will be good for families? Luckily, there are a few criteria that can help you weed out some of the contenders. What Size Dog Is Right For My Family? First, think about size. Do you want a small dog? A large dog? Or something in-between? Size matters for several reasons. Some people just like big dogs. Others want a dog that can fit on their lap for cuddles. If you live in an apartment, you might want to consider a small or medium dog breed. Even laid-back large breeds can seem like they are taking up a lot of space. 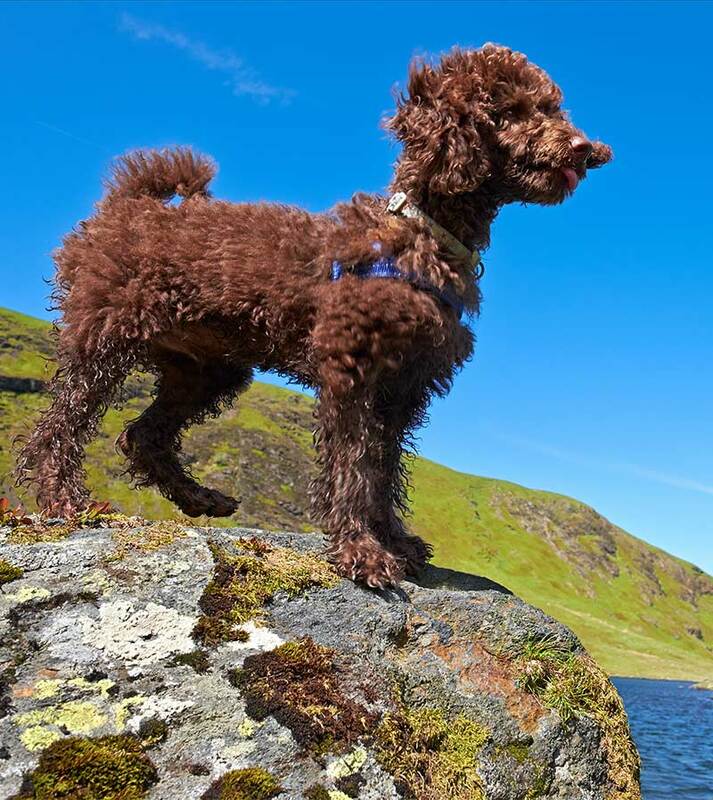 On the other hand, if you plan on taking your new dog on lots of long hikes, you need a dog that can keep up with you, which may rule out certain toy breeds. Other factors determine the size of dog you choose, such as how long you can expect the dog to live, and even how strong you are! Once you determine the size, it is time to think about health. Dogs that are prone to serious medical conditions require money and time, which most of us don’t have. Some dog breeds have amazing personalities, but come with veterinary bills that can rival your car payment. There is also the big question of whether it’s morally right to buy a dog who is born to suffer from medical issues related to their structure. Unless you are prepared to take this on, look for breeds without major health problems. Be sure to ask your veterinarian about any breed-related risks. 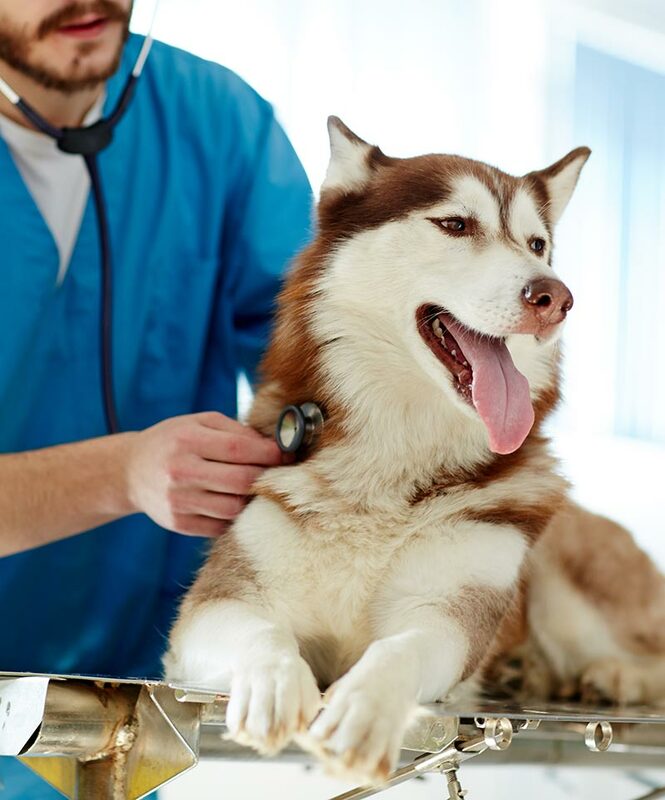 Almost all pedigree breeds of dog come with some potential genetic diseases, but health screens exist for many of them. Before you buy a dog, look into the diseases that can affect them and make sure you pick a breeder who health screens both parents. The third deciding factor is personality. When we think of family dogs, most of us picture friendly, outgoing dogs that get along with people and other animals. This is especially important for social families or families with small children. Not all dog breeds have a reputation for outgoing personalities. These breeds are very good at what they do, whether it is police work, guarding livestock or family, or engaging in high energy dog sports. But they might not be a suitable choice for your first family dog. The search for the perfect family dog is a bit like looking for a new car. Do you want an expensive, fast, flashy model that doesn’t do well on rough terrain but will impress your business clients? Or are you looking for an all-around family vehicle that can fit all the kids and still take you to work without breaking your budget? 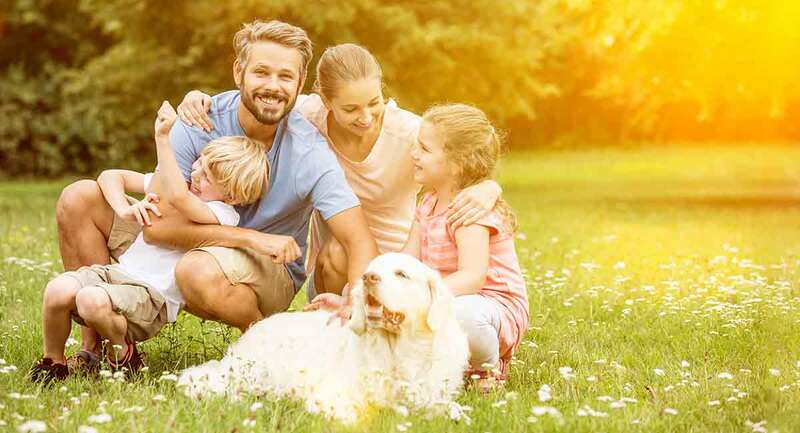 One of the biggest mistakes many families make when searching for the best family dog is choosing a dog that fits their idea of what their family is, instead of the reality. If you don’t currently go for a three-mile-long run every day, chances are getting a dog won’t change that. Be realistic in your expectations. If you enjoy spending a lot of time relaxing on the couch, find a dog breed that also enjoys cuddles and down time between exercising. If you really do go for three mile or longer runs every day, then a higher energy, more active dog breed will be a better fit for your family. Do you have kids? Or do you plan to start a family in the next few years? Children can be challenging for many dogs to handle. If you have kids, especially small kids, then you want to make sure that you choose a dog breed that is typically good around children. However, keep in mind that obedience training and socialization are just as important as choosing the right breed when it comes to ensuring your dog gets along well with kids. 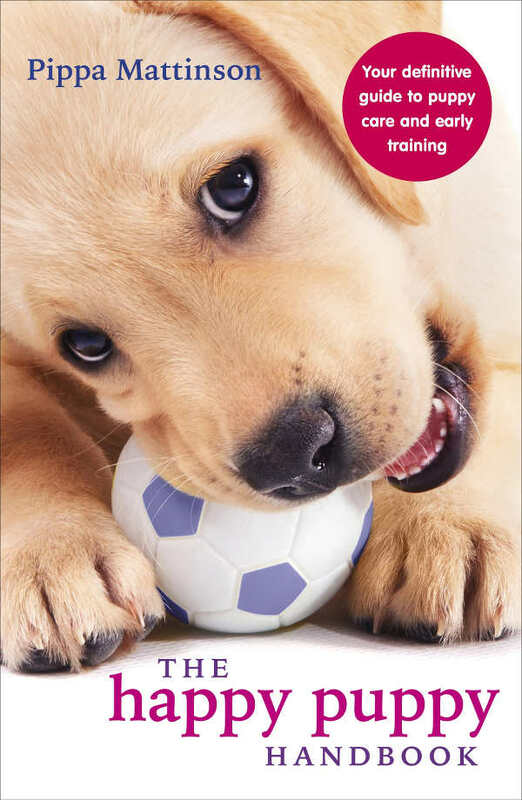 Most dogs can be trained to do well with other pets, especially if you get them as puppies. But breeds with high prey drives might not be a good choice if you plan on having other little animals around. Even if your dog is friendly with other animals and plays calmly, sometimes instincts can be overwhelming, leading to the smaller animal being harmed. Do you have a large yard or a small apartment? Do you rent or own? Does your town, insurance policy, or landlord have breed restrictions? The answers to these questions can help you eliminate certain breeds from your list. Dogs require time, energy, and attention. If you are always on the go and don’t have a lot of time to devote to dog-related activities, then an intelligent, active breed is a bad idea. These types of dogs require exercise and mental stimulation. Without it, they will find other ways to entertain themselves, usually at the expense of your yard or furniture. All dogs require regular exercise and attention, but some breeds require more than others. Make an accurate estimate of how much time you plan on spending with your new dog. Small dogs are easy to take with you on the go, and won’t require an extra-large vehicle or crate. There are many small dog breeds out there that are suitable for families, but these breeds are a good place to start your search. The Whippet is a great choice of small dog for many families. They’re sweet, loving and loyal. They need intense short periods of exercise, but will relax in between. Their personalities aren’t pushy, and they enjoy being around calm children. 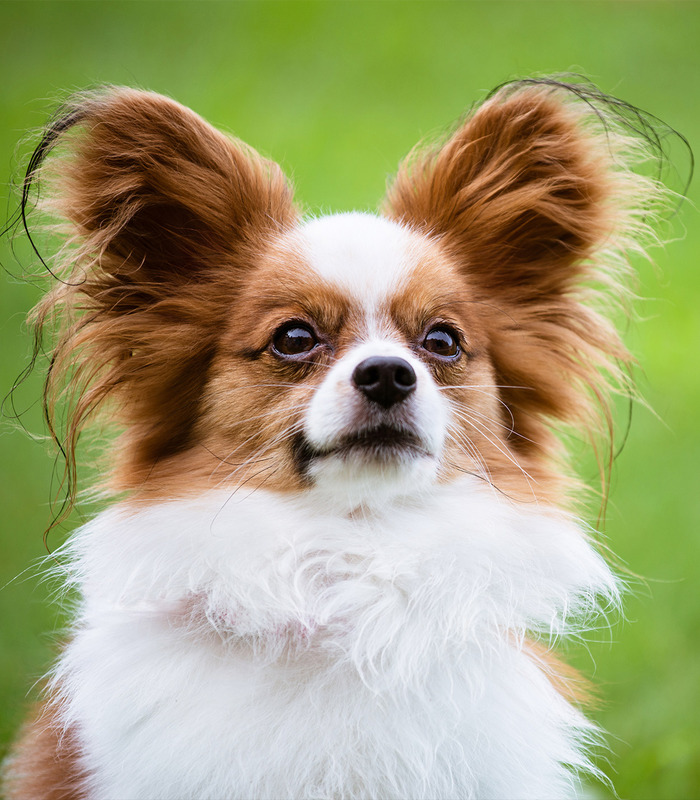 The Papillon is a small but energetic breed, perfect for active families with small living spaces. Papillons are famous for their intelligence, and excel in dog sports like obedience or agility. This breed is generally good with children, but their small size means that careless roughhousing can be dangerous without adult supervision. The Bichon Frise was bred to be a companion. 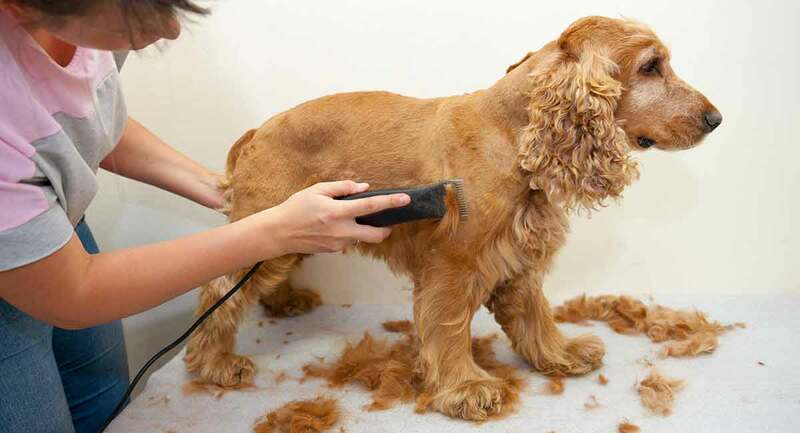 This small dog requires professional grooming, but the flip side is that they scarcely shed and can be a good choice for families with allergies. Bichons are usually good with children and other animals if properly socialized, and are known to be affectionate, playful, and charming. Maltese Terriers are another great choice for a small family dog. However, they are very tiny and delicate, and therefore require lots of supervision around younger children. Miniature Poodles are sturdy little dogs that love to goof around with their families. These dogs are larger than their Toy Poodle relatives, and are playful, affectionate, and capable of outsmarting you and your entire family if you don’t pay close enough attention. Medium sized family dogs offer the best of both worlds. Not too small to be a potential risk around small children, but still small enough to fit in most apartments, medium sized dogs are a good compromise. Let’s take a look at some options for good family dogs in the medium range. 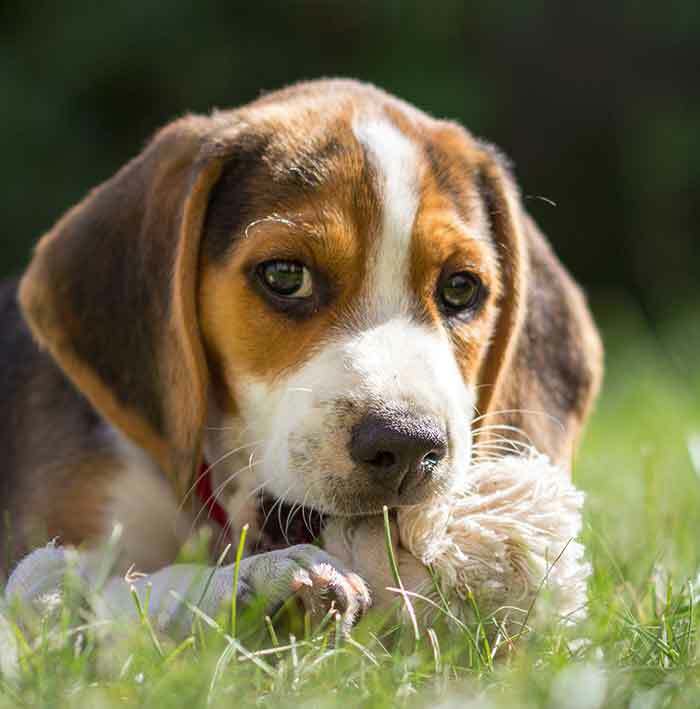 The Beagle is one of the most popular medium sized good family dog breeds in America. They have a reputation for being good with kids, and these playful hounds require minimal grooming. Just be prepared for many long walks with lots of sniffing to keep your Beagle fit. Beagles are also very vocal, so be ready to train them with “no bark” cues, such as outlined in this training guide. 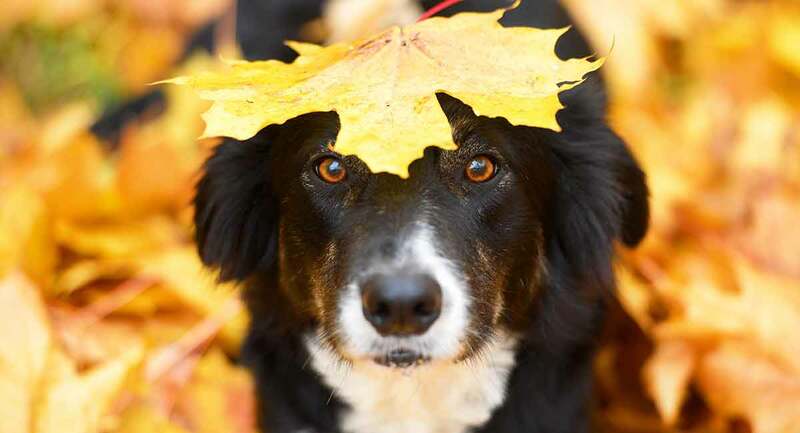 Border Collies are outgoing, people pleasing, and intelligent. They bond closely to the members of their family. Collies are a good choice for families who have lots of time to spend outside with their dogs playing fetch. But be prepared to come up with new games to keep your Collie entertained. Did you know that Cocker Spaniels used to be quintessential family dog before Golden Retrievers and Labrador Retrievers took the spotlight? These affectionate bird dogs require professional grooming, but their sweet, playful natures makes them well suited for family life. 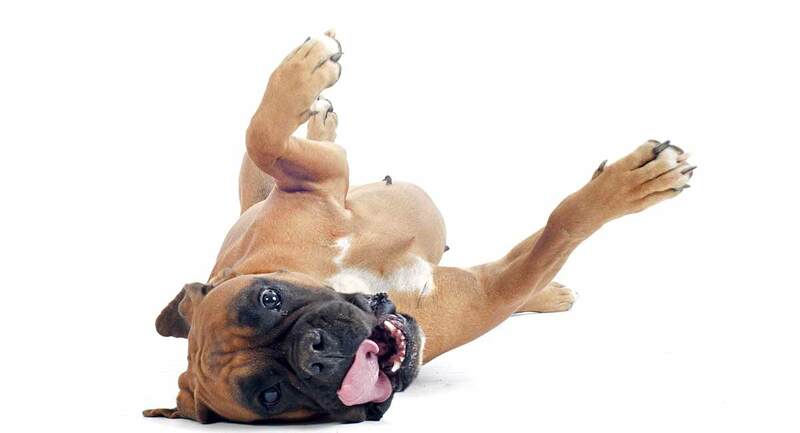 Boxers are medium-to-large dogs with a stellar reputation for being good with children. Active and energetic, they’ll play with their family for as long as they can get the attention! They were originally bred as guard dogs, and so will likely be wary of strangers. Socialization is very important in this breed, as in others. Some people are small dog people, and others are big dog people. If you love big dogs, here are a few large family friendly dog breeds to consider. Labrador Retrievers have topped the American Kennel Club’s list of most popular good family dogs for the past five years, and with good reason. 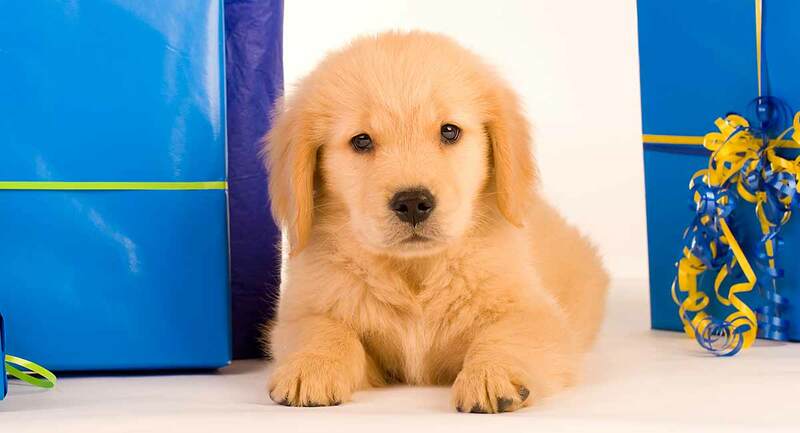 These easy-going, affectionate retrievers love spending time with their families and friends. Labradors require regular exercise and activities. They are best suited for active families who love the outdoors, especially during their notoriously exuberant teenage years. The Golden Retriever also makes the AKC’s list, coming in at third place. Goldens are good family dogs. They love to please their people, and are affectionate and gentle with adults, children, and other animals. Like Labradors, they require regular exercise and love a good game of fetch with anyone who will throw the ball. Many people dismiss Poodles as showy, fussy dogs without knowing much about them. But Standard Poodles, much like their smaller counterparts mentioned earlier, are incredibly intelligent, affectionate, and infamously goofy with their families. 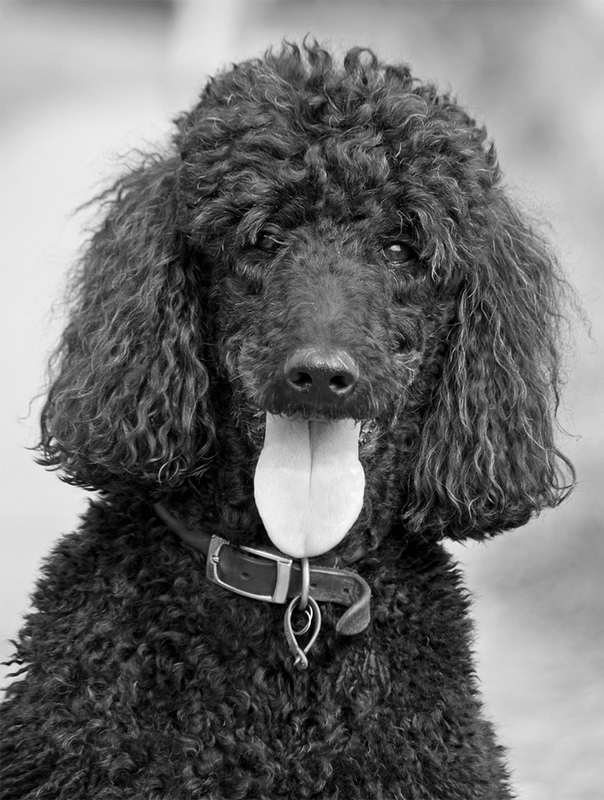 The breed can be a little aloof with strangers, but if you want an active, intelligent, large breed dog that doesn’t shed, then the Standard Poodle could be perfect for your family. The Newfoundland is more than a large dog — he is giant! But this large breed has been nicknamed the “nanny dog,” based on their reputation for gentleness and care with smaller children. Of course, caution must always be taken when little children are with pets, regardless of the size. Newfies are incredibly attached to their families, and do require lots of attention in return for the love they lavish on their people. Once you have narrowed down your list of family friendly dog breeds, it is time to make a decision. The first is to research your top breeds as much as you can. Look online at breed enthusiast websites, and see if your local library has any books. Find out what health issues may affect purebred lines and what screening tests responsible breeders use to avoid them. Learn as much as you can about the breed’s typical temperament and breed history. Once you have done all your homework, arrange to meet some dogs from your list. Do any of your friends have one of these family dog breeds? Can you set up a meet and greet with you and your family? While you are spending time with these dogs, be sure to ask their owners for their opinions about the breed and about any tips they may have. Then, look around to see if there are any breeders or rescue organizations in your area that have your top choices. Make a list and choose the organization that best fits into your budget and needs, and start researching your new dog’s veterinarian. Most breeds of dog can make good family dogs with proper training, socialization, and preventative veterinary care. However, some breeds, especially working breeds, are better suited for experienced dog owners or for families without children. If you do decide to select a dog breed that is considered “advanced” or “difficult,” make sure to consult with a professional trainer to ensure your family and your dog stay happy, safe, and healthy. Training is just as important for family dog breeds as for working breeds. The breeds featured in this article are often recommended for families by experts like trainers and veterinarians. However, that does not mean that they will grow into good family dogs without help. Training and socialization are crucial for raising great family dogs, so be prepared to put in the work. 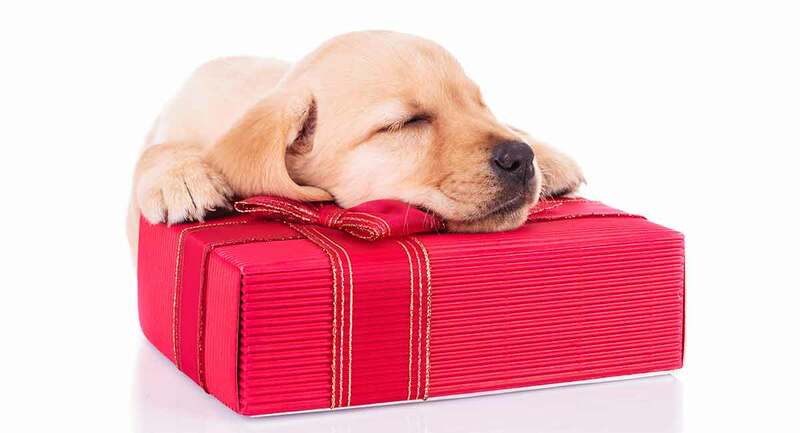 If you do, then you and your family’s new dog will have years of great memories ahead. What breed are you planning to research for your new family dog? Let us know in the comments! Seymour, K. “Veterinary Professionals Vote on the Best Dogs for New Owners,” VetStreet.com. June 2013. What are the best breeds for “elderly” folks? I (wife) have had Rotties, husband always had smaller, yappy dogs. I’m ood with German breeds, he gets along with anyone…I’m wondering about a Berner or a Swissie. Our dream is a Weimeraner but woorry about its exercise needs. I agree that you need to take your size preferences into account before you choose a dog. It would be good to find a dog that fits with your family well. We have a young son, so maybe a labrador would be good because he would grow with our son.